In December last year we reported on the first ‘Access to Energy’ Shell Foundation – Victron Energy microgrid in Ligad, North of Palawan island in the Philippines. Thousands of people still live in such areas where there is no access to electricity and the likelihood of any utility grid connection is aeons away. The Shell Foundation however set about changing that with the advent of that initial Ligad microgrid using Victron components. Now there is a second – and as I write this blog a third is also on its way. Power for the powerless is certainly becoming a reality. Let’s just remind ourselves of the area for these projects. Palwawan island has been chosen several times as the most beautiful island in the world. Not surprising really as the Province of Palawan is an archipelago in the Philippines which includes two UNESCO World Heritage Sites plus breathtaking endless white beaches, wild forests and rugged mountains – all of a pure and untouched nature. The Puerto Princesa Subterranean River National Park for instance is classed as one of the New7Wonders of Nature. Like the first microgrid this second one is situated in the North of Palawan island, but this time it is the village of Sitio Binaluan, Barangay (meaning rural district) Liminangcong, in the municipality of Taytay. Victron Energy equipped once again, this microgrid is for 95 houses and has been up and running since February this year. Once again it was Koos and Josie Mulder of JK Solar Power House and their team who did the impossible. It might not be the correct photo size ‘exactly’ for this blog of the team – but as you’ll see there were far greater challenges than pressing a camera button and sending me large format photos – so it would be remiss of me not to include the photo of these stalwarts! JK Solar Power House team pose with the Victron Energy system components. So, back to challenging logistics? The land journey begins – replete with Victron Energised hats! In the absence of horsepower, cow power rules. Generator in place – not the easiest of items to get up the hill! wind production should not be enough. The microgrid can be monitored via the Victron VRM website, but is unfortunately not always online. Whilst a good electricity supply has been achieved – it seems a solid internet connection is still on the wish list! “Again, a whole community has access to basic electricity and they can only benefit from it, for education, computers or laptops, for comfort such as some fans or a few freezers for ice making, streetlights, TV – the simple things which will change their lives forever. My own thanks to all the parties mentioned above for the information and images used in this blog. JK Solar Power House – System design and installation. 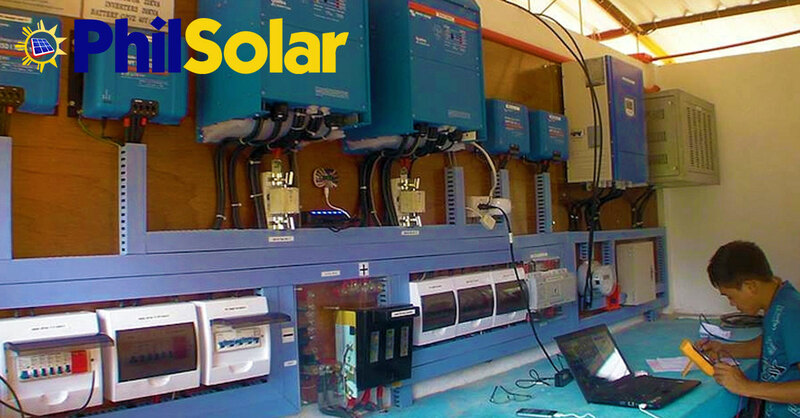 PhilSolar Equipment and Trading Corporation – Supply, import, logistics and Victron support.